As a brass player, you do get to meet some interesting people. I was extremely pleased when Rachel sent round an e-mail asking who would like to be involved in the launch of Neighbours on Channel 5 TV. Richard Clifton and Martin Garnett came along as well. The idea was to get Harold Bishop, the star of the soap to play the tuba (for those of you who don't watch "Neighbours", he is a brass player apparently). 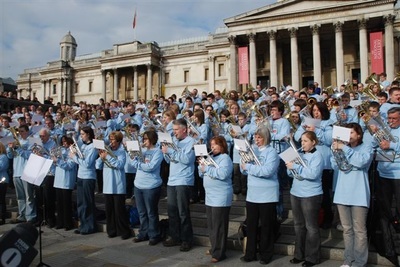 He would then front up a band of about 300 brass players from different part of the country. It was a beautiful sunny day on the 7th February and we were all given a very nice light blue T-shirt, a packed lunch a can of Coke, a music card and a legal form to sign waiving our copyright and then we all assembled on the steps just in front of the National Gallery. There was no such thing as a tune up because with over 300 people there, you're bound to be in tune with somebody. The organisation was pretty good but they had omitted to provide the conductor with any form of amplification so we could see him but couldn't hear a word he said. 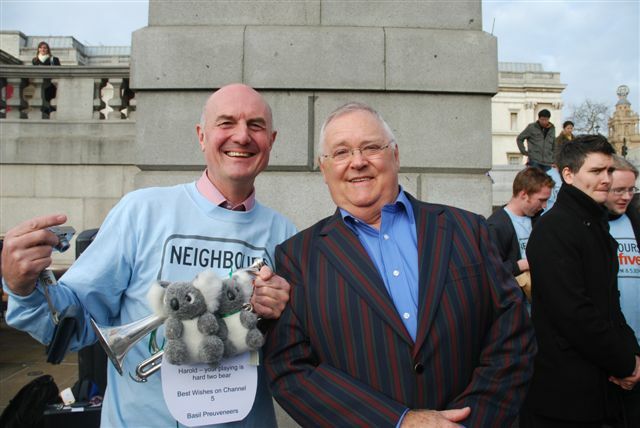 We played the Neighbours theme through and it sounded very nice indeed - to the great surprise of most people in fact. There was a huge crowd and wonderful applause. Harold Bishop then came forward to join in. It was interesting to note that when you're famous somebody else carries your tuba on stage for you- a "tuba-caddy" you might say. We then played the Neighbours theme through again in front of more cameras than I have ever seen in my life. The audience were again extremely appreciative. Just then two more coaches of very distressed young brass players arrived. They had been stuck in traffic and had missed the whole event but the organisers were very kind and allowed them to join in and we played it through yet again. I was interviewed for Channel Ten Australian TV and asked what I thought of Neighbours and whether it was popular with English people because they envied the Australian way of life! Imagine our disappointment when viewing channel 5 News later that evening to see that was only about 15 seconds of a performance actually on TV. I did however spot myself in the distance but I hardly think my television appearance would be noticed by many people.